It is not necessary to stress all the challenges that come allong with wide range integration of renewables into the power grid at this article. You easily find this somewhere else, in this blog or at another source in the web. But I want to focus your attention on a tool that can help to deal with this challenges and work torwards solutions. It is a lot on matching climate dependent production with the personal demand which is currently noticed only in average. The various influences on residential load profiles are diverse and include weather conditions, availability of other resources, personal habits and also social phenomenas. This variaty is a reason why Marija Ilic speaks of just-in-time and just-in-place services in the conntext of Smart Micro Grids. Developing of or researching on such services requires a flexible simulation tool with possibly high usability. This is exactly what RAPSim is aiming at. RAPSim was presented in front of interested audience at the ISGT Asia – 2014 conference in Kuala Lumpur in May 2014. Since then the software project is downloadable for free at Sourceforge.net. A graphical interface to create the intended scenarios and to control the simulator functions. Functions to save and load simulation scenarios in a generic xml format. A time thread that models time of day and day of the year and handles up to minute resolution. Generation of output files in csv-format. Object parameters can be selected to be written into a file at each time step. Weather simulation which can be done via stochastic models or simulated by measured data. Topological grid analysis that collects objects of the same bus in a list and aggregates their parameter values. Administration of algorithms for grid-wide calculations. Administration of object specific models that can be easily implemented by the user. The software is written in Java and provided with the source code so that it can be imported into a Java IDE such as eclipse. The development of the software is still ongoing. Try it out and give us feedback by adding a comment or sending a ticket to helps us to further improve it. Please spread the news about the tool, while we will do the best on our part so that onces RAPSim may become a synonym for rapid simulation in the field of mirco grids. Once more here the link to the sourceforge page. M. Pöchacker, T. Khatib, and W. Elmenreich. 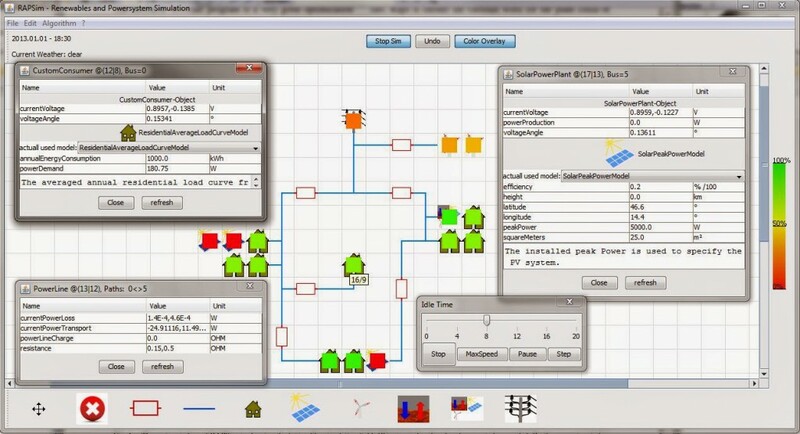 The microgrid simulation tool RAPSim: Description and case study. In Proceedings of the IEEE Innovative Smart Grid Technologies Asia (ISGT-ASIA’14) , Kuala Lumpur, Malaysia, 2014. IEEE. This entry was posted in Publikation and tagged energy distribution, smart grid, smart microgrid, software on July 23, 2014 by Wilfried Elmenreich.